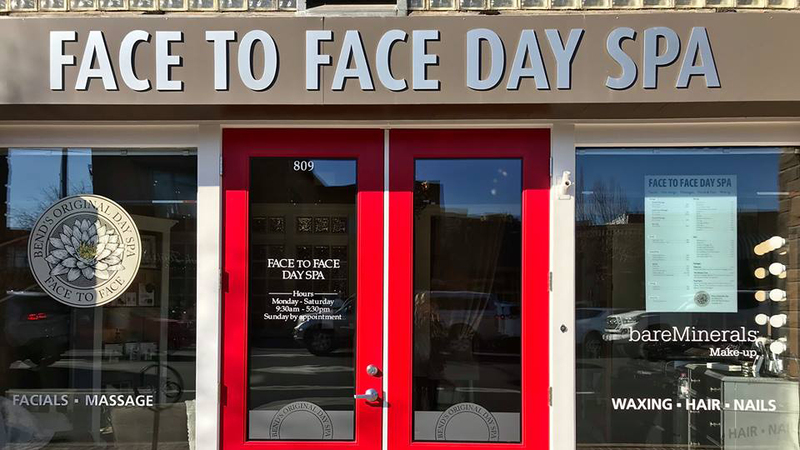 Welcome to Face to Face, Bend’s original day spa. Located in the heart of downtown, this is the oasis you’ve been looking for. Tranquil surroundings, attentive staff, and so many rejuvenating treatments to choose from. Weary muscles will welcome a choice of massages, from hot stone to Swedish, even prenatal for the mama to be. Or, show your skin some tender loving care with one of Face to Face’s many signature facials, all of which include a soothing hand and neck treatment to increase relaxation. Nail services include traditional manicures and pedicures, or choose shellac for long-lasting sparkle and shine. For tresses in need of attention, the Face to Face stylists offer color design, weaves, and conditioning treatments, as well as cuts for the whole family. Waxing services round out the spa menu and will keep face and body sleek and smooth. If you’re looking to keep that spa glow going, a visit to the spa’s well-stocked retail store is a must. You can purchase a full range of quality products from Bare Minerals, SkinCeuticals, Paul Mitchell, Juice Beauty, and SunFX. For the pampering you deserve, Face to Face Day Spa is the place to be.